Looking to book a library, school, or author visit? Want to connect to creators of material for childrens or teens within Wisconsin? 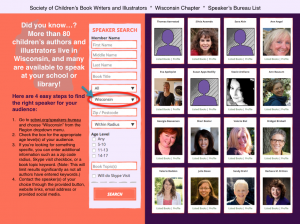 Don’t miss our SCBWI-Wisconsin Speakers Bureau! Download these quick-access resources or browse the complete speakers bureau online at scbwi.org/speakers-bureau. (Pro Tip: select “Wisconsin” in the Region drop down menu to filter results to authors and illustrators within our area, and save on travel costs and scheduling headaches). 2019 Marvelous Midwest Conference: Let’s Go to the Fair! SCBWI-WI Diversity Committee Grant WINNER!